Newts of all kinds are very popular with amphibian keepers. Although most in the trade are quite small, one of the hardiest and most personable is a true newt giant. The attractive Spanish Ribbed Newt (Pleurodeles waltl) can reach 12 inches in length, and is stoutly-built. They are easy to breed – an important consideration as wild populations are threatened – and quickly learn to feed from the hand. And, as you’ll see below, they employ on of the animal world’s most unique defensive strategies (pets, however, become so tame that they never feel the need to defend themselves!). Newts and salamanders have always held a special fascination for me. Beginning in childhood, I sought to breed as many species as possible, and I focused on their husbandry and conservation when I entered the zoo field. In time, I wrote a book summarizing my experiences. The passage of so many years has not dulled my enthusiasm for any of these fascinating amphibians, but the Ribbed Newt has always been a personal favorite. The term “newt” is usually applied to small, semi-aquatic salamanders in the family Salamandridae. The group’s 80+ species range throughout North America, Asia, Europe and parts of North Africa. The Ribbed Newt may reach 12 inches in length, but most newts top out at 4-6 inches. Spanish Ribbed Newts are generally grayish-brown in color, but some exhibit yellow or green hues, while others are nearly black. Rows of yellow to orange “warts” (poison glands) line the upper edge of the body. Amazingly, distressed individuals will contract their bodies and force the ribs right through the back’s skin, directly over these glands. The toxins contained therein are thus in a position to thwart most predators. Neotenic adults (bearing gills and totally aquatic, but able to reproduce) have been found in the wild and reported by hobbyists and lab caretakers. A strain of leucistic (white in color) Ribbed Newts has been developed by private breeders. The largest Ribbed Newt I’ve encountered was built like a well-fed Tiger Salamander, and measured just over 12 inches in length. Most adults top out at 8-9 inches. Two related species, rarely if ever seen in the pet trade, are classified in the genus Pleurodeles. The Spanish Ribbed Newt is limited in range to Spain, Portugal and Morocco, and is generally found in arid habitats. Highly aquatic, it favors temporary and permanent ponds, swamps, canals, and other stagnant or slow-moving bodies of water. In Morocco, Ribbed Newts have been found living in cave waterways 100 feet below-ground. Ribbed Newts are always nosing about for food, exploring, and interacting with tank-mates. They see well and may swim to the aquarium’s side when you enter the room, in anticipation of a meal. Handle newts only when necessary, and with wet hands, so that the skin’s protective mucus covering is not removed. Ribbed Newts are almost entirely aquatic, but do need a place to haul out and rest. The water in their aquarium can be deep, provided that egress is simple…cork bark, turtle platforms, and floating live or plastic plants all serve well as resting spots. Newts are perfectly suited to aquariums stocked with live plants, and spectacular displays can be easily arranged. Plants help maintain water quality, and the complex environments they create make life more interesting for both newt and newt-owner alike. Smooth, rounded gravel of a size that cannot be swallowed is ideal; rough stones will injure the delicate skin. Bare-bottomed tanks, which are easily kept clean, may also be used. In common with other amphibians, Ribbed Newts have porous skin that allows for the absorption of harmful chemicals. Careful attention to water quality is essential. An aquarium pH test kit should always be on hand. Ribbed Newts fare well at a pH of 6.5 to 7.5, with 7.0 being ideal. Ammonia, excreted as a waste product and produced via organic decomposition, is colorless, odorless and extremely lethal to all amphibians; a test kit should be used to monitor its levels. Chlorine and chloramine must be removed from water used for any amphibian. Liquid preparations are highly effective and work instantly. Copper may be leached by old water pipes; a test kit should be used if you suspect its presence. Undergravel, sponge, and most other filters designed for use with fish, reptiles and amphibians can all be used in Ribbed Newt aquariums. Even with filtration, regular partial water changes are essential in keeping ammonia levels in check. As Ribbed Newts are not strong swimmers, water outflow from the filter should be mild; plants, rocks and movable outflow attachments can be used to reduce current strength. Newts do not require UVB exposure. UVA light is not essential, but may encourage natural behaviors. Ribbed Newts fare best when kept fairly cool, i.e. 60-68 F., although temperatures to 72 F are usually well-tolerated. Temperatures consistently above 75 F may weaken the immune system or cause other health problems. Temperature tolerance seems to vary among populations, and may be linked to the portion of the range from which the animals originated. 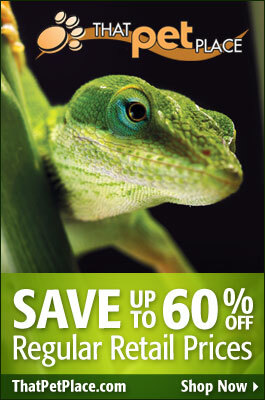 Zoo Med Aquatic Newt Food and Reptomin Food Sticks can be used as the basis of the diet. Freeze-dried shrimp, “gelled insects”, and frozen fish foods (i.e. mosquito larvae) should be offered regularly. A variety of live foods will help ensure a balanced diet. Blackworms, bloodworms, earthworms, guppies, small crickets and similar foods will be eagerly accepted. Stocking the aquarium with live blackworms and guppies will keep your pets active and occupied. Ribbed Newts reproduce quite regularly in captivity, and provide an excellent introduction to amphibian breeding. Breeding sometimes occurs spontaneously but results will be improved if you manipulate water temperatures and day length somewhat. Unlike many amphibians, Ribbed Newts may even breed following a 1-day change in water temperature. Please post below for detailed information on inducing reproduction and rearing the young. Please check out Newts and Salamanders, a book I’ve written on their care and conservation. Previous: Frog Facts: New Species Has Fangs and Gives Birth to Live Tadpoles! How do the newts recover after they stab themselves with their ribs to release the poinson/toxins? This injury seems like it could be lifethreatening, particularly considering infections? Doesn’t that species grow thicker skin and estivate when ponds dry? Have you ever cared for estivating salamanders? The estivation technique would be very useful for those living in warmer climates and cannot keep them cool all year. Also, is there any heat tolerant salamander? 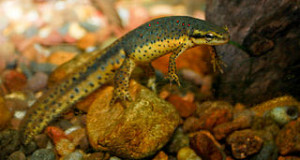 Sharp reibbed newts inhabit some quite arid regions, but are not known to aestivate; when temporary pools dry up, they move across land to new sites. They are most often found in relatively deep pools, limiting the need for migration to other sites. Co-workers of mine have come across apparently aestivating amphiumas, but we have not try to induce this in captivity. Eastern newts (Notophalmus spp.) and Web-Footed Salamanders (Bolitoglossa spp.) come to mind as somewhat heat tolerant, but this varies among different populations. Amazingly, 1 species of African lungfish has been documented in aestivation for 4 years! African bullfrogs do so for at least 9 months, possibly to 1 year or more. I have 2 Iberian Ribbed Newts my breeding pair. My first try I successfully kept 2 babies. Another boy and girl. My question is since the parents are both regular colored would they be able to reproduce a Leucistic baby?